Please note: This article was updated on October 1, 2015. You know how the first time you came to a busy drop zone, it seemed like all the parachutes were flying randomly around the sky? But now that we are skydivers and understand flight plans, we see some degree, at least, of order in the chaos. We’d like to further increase the amount of order in our canopy flight traffic by reminding everyone that we have three separate landing areas at Skydive Spaceland: One for jumpers with D license experience to address the tighter area, obstacles, and increased traffic; another for students and slower traffic east of the hangar; and the swoop pond/alternate landing area across the runway. Also, remember to fly a predictable pattern regardless of where you’re landing, so other skydivers can have a reasonable expectation of where you’re going. It’s fairly common for newer canopy pilots to arrive in the pattern too high and sashay back and forth to kill altitude, but this forces all the skydivers above you to continually adjust because they can’t tell where you’re going. If you find yourself high in the pattern, learn from that for next time, and for now use a deep brake approach or your front risers to lose that extra altitude. Low man has the right of way in all landing areas. Do not cross the runway under 1,000 feet when aircraft are using it. The runway splits the property, so be aware that airplanes and skydivers share this property and aren’t completely separated. Both parties must consider the others’ needs to use the property safely. If you are unsure if the runway is in use, don’t cross it below 1,000 feet and you may need to land south of the runway. Please see this article for our current landing areas divisions. 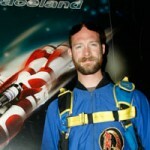 Kritter is an Accelerated Freefall Instructor, Tandem Instructor, and videographer at Skydive Spaceland. Good show. I jump at a lot of DZs and I wish more of them would designate landing areas and procedures and insure that all jumpers understand them. Now watch me screw it up!! Thanks Cliff! 🙂 And I have faith in you!